High Ice Ak is not sponsored by any outdoor manufacture and pays out-of-pocket for gear. This gear must perform in the extreme climate of Alaska to keep the climbing action going. Yes, at times, I am afforded the opportunity to test and give feedback on new gear but there is no paid endorsement from the gear company like most reviewers so you get a more honest review. Are there biases, sure but I feel my bias are what works under real climbing not what will be appealing and sell to the mass because I paid a good some of money to say so. All the gear listed below is tested and used by me, and is certified High Ice Ak Select to be light, simple, and designed for real climbing. Each High Ice Ak course will give complete details on how to select the proper gear. Primaloft Insulation: Has the greatest insulation-value-per-weight-per-compressibility of all synthetic insulation. The slicken'd fibers actually rappel moisture which means there will be more warmth when it gets wet like the alpine world is. This also means it dries extremely fast even for a synthetic insulation. There are several versions Primaloft with PL1 having the highest warmth to weight ratio and fastest drying in the Primaloft line and of course PL1 smokes the other sythetics on the market. Rumors of Primaloft going flat after just a few uses are just not true; my 8-year old jacket, pants and sleeping bag are still functioning. High Ice Ak does not recommend the use of down in the alpine environment. Epic Microfiber: The best micro-fiber currently on the market. This stuff is virtually weatherproof yet breathes exceptionally well to dry damp under layers. And it rarely wets-out keeping vapor transfer at a maximum. Always us a micro-fiber shell for high vapor transfer that will allow water-saturated body heat to escape during movement. Using a micro-fiber shell on sleeping bags and bivy sacks will dry damp clothing while the body in cocooned. Waterproof / breathable shells like Gore-Tex and Dryloft do not breath well enough for clothing or sleeping bags and will trap moisture next to the skin and in insulation reducing loft and causing chills. Outdoor Research Quadratic PS50 Suit: I like a one-piece base layer so there is less material bunching around my mid section under my harness and pack waist belt and of course they are lighter in weight. This suit has just enough warmth and is quick wicking for a base layer with plenty of stretch for movement. The neck to tail bone triple zipper vents and allows easy dropping of body waste. Wild Things Primalight Jacket: The perfect insulating mid-layer; filled with a single layer of 1.8oz Primaloft PL1 to keep the core warm whether dry or damp that has more warmth than the others but lacks the thick bulk under a shell. A slick inner and outer shell slides over a base layer and under an outer layer. Patagonia Super Guide Jacket: Sewn from Patagonia's 8 ounce softshell fabric with welded seams technology, this softshell has some warmth with superb stretch and breathability, even for a softshell. Its cut clean and trim. Patagonia Simple Guide Pants: The perfect compliment to pair with the Super Guide Jacket. Patagonia's new 6 ounce softshell material with their industry leading DWR woven into the standard guide pants pattern. Patagonia's revolutionizing glued seams along with a simple design creates a 13oz pant that is made for the alpine game. Wild Things Hooded Epic Jacket: While I do not find many times this jacket needs to be used, it does add weather protection with a hood. The Epic has higher performance in the hills than any other material and at 10 ounces in weight, one of the lightest. Wild Things Belay Jacket: Filled with 6oz Primaloft PL1 insulation under an Epic micro-fiber shell, this jacket has no peer for warmth Vs. it's weight. I have used jackets a few ounces lighter but they didn't provide the heat level and weather protection of this jacket in nasty Alaska conditions. I tried jackets that were heavier and reported warmer but I didn't feel the difference, they only had more weight and took up more space in my pack. The hood of this jacket fits over any helmet and snugs around the face to protect against those howling Alaskan winds with swirling spindrift during belay duty. No flaps on the pockets to add weight or get in the way. Wild Things EP Jacket: This jacket is nothing but superb. Filled with a single layer of 1.8oz Primaloft PL1 under an Epic Shell. This jacket is perfect for spring through fall in Alaska, and most times climbing winter ice and mixed in Southcentral Alaska. Wild Things EP Pants: These have just enough warmth with 1.8oz Primalft PL1 to keep the legs warm during belays, even in Alaskan winter. And of course the Epic shell beats back any Alaskan blow yet will allow under layers to dry during use. One of the good things about small US owned companies such as Wild Things, they will customized, with-in reason of course and I had these sewn with a belay zipper and had the ankle cuff guards left off to decrease the weight. Wild Things Alaskan One-Piece Suit: This is the Alpinist Suit fully insulated with 1.8oz PL1. The eVent shell is lighter and more supple than Gore-Tex XCR and transmits vapor at a higher rate plus its pores do not plug up with moisture, grime and sweat decreasing vapor transfer like Gore-Tex. This suit has to be custom sewn from WT and I had mine sewn without leg zippers; from the elbow and stop at the waist. Yea it's warm but not as warm as you would think. Most climbers wear more warmth in their clothing system than the 1.8oz Primaloft. Unzipping the elbow to waist zippers and pulling my arms through, unzipping the front to the waist has enough air flow to keep my core cool even while skiing on approach. I wear this suit mostly alpine climbing or in areas that have howling wind where soft shells are too porous. This suit provides protection and warmth at less weight with less restrictive movement than multilayered clothing. A light base layer like the Outdoor Research PS50 suit under this Alaskan Suit is all that is needed from +10F to -20F. Add the Belay Parka or EP Jacket for stoppage time. The hood fits over any helmet with good peripheral vision, a chest-to-tail-bone, through-the-crotch, triple pull waterproof zipper completes this suit. Patagonia Stretch Element Gloves: While these gloves are not the most waterproof on the market, but what glove actually is, they do provide the most warmth with the best dexterity for cold weather alpine climbing. A plus is the double closure on the guantlet which seals up tightly for no gap-oasis inlet against the elements. The pull cord on the guantlet is short keeping this nuisance cord out of belay / rappelling devices. The liners are very quick drying and a spare liner or two will keep the hands dry and warm the whole climb. Outdoor Research Contact Gloves: These are darn near the perfect ice climbing gloves: a stretchy softshell, 300 weight fleece insulation with foam padding across the knuckles in a very nimble package. No other glove has the dexterity and warmth of these gloves; I have climbed in them in temperatures well below zero with no cold fingers. Tool Stick: Cut the plastic loops off that are there to clip the gloves to each other. These tend to work their way under ice tool leashes and can become painful. La Sportiva Trango Extreme EVO Light GTX / Duratherm Boots: Could the name by any longer? This is the current T.E. EVO GTX with 200g Duratherm for insulation for those who didn't know it and of course complained the boot was chilly. A full Gore-Tex liner keep these boots waterproof even with all the seams. Built around the new Trango 2 last that has a more volumous toe wiggling toe-box, a synthetic upper with a lacing system that dials in the fit and a highly articlating 3D Flex ankle design, and you get these super-light beauties. La Sportiva Nepal EVO GTX Boots: The most popular insulated leather single mountaineering boot in the world has evoled. It's warmer with better insulation, increased ankle articulation with La Sportiva's 3D Flex multidirectional ankle that includes an elastic integrated snow protection gaiter, and almost a full pound decrease in weight. I know all the hoopla over Gore-Tex in boots but contrary to beleif, the old Nepal Extreme had a waterproof / breathable PTFE barrier in the upper only but now Gore has allowed La Sportiva to use their hang tang since the entire foot is surrounded by Gore-Tex. The new adjustable tongue is made from a soft breathable material for dailing the fit and venting of the foot, the old heavy-stiff leather tongue of the Nepal is gone. While these changes are minor they do have a major impact on its approach and climbing performance, and with the removal of some leather and rubber, these boots went on a diet for a svelt and warm steep action climbing boot. La Sportiva Spatnik Boots: After three full seasons with the Nuptse on my feet, it has been outdone. The Spantik is over a full pound lighter in weight and is over two grades heavier in climbing performance. It is constructed with the same composite shell of the Nuptse but this is where the similarities cease. The biggest improvement was replacing the old heavy wrap around bathtub of rubber MPE sole and rand with the more nimble layered Nepal Evo sole, mid sole and rand. The removal of all the rubber lightens this boot significatly but the biggest improvement is in the use of Nepal sole and mid sole. The Nepal sole is trimmer around the circumference of the whole boot getting the feet closer to the action for better control. The Nepal Ibi-therm sole is quite stiffer in flex, less approach comfort but much better climbing performance in which I beleive is an improvement. The asymmetrical tongue with a single lace (Flat Lacing System) is a thing of performance beauty. Stiffer than the Nuptse but offers greater front pointing performance. A slit in the PU outer shell running down off to the big toe side subtracts all the extra shell material and bunching for a trimmer and lighter foot package. A single one hand lace can be pulled with a gloved hand and there is no knot to tie, just pull the lace tight and snap it around the speed hook for instant lacing. The inner boot is constructed from a new foam that is also thermal mold that is not as warm as the Nuptse but it gives better form fitting and has a more precise fit into the shell. These boots scream for technical alpine routes like The Rib, The Cassin, Huntington, Hunter and the Great Gorge, but climbs technical waterfall ice and stiff mixed better than all but just a one hand full of single boots. No boot this warm climbs stiff lines as well as the Spantik. Tool Stick: The lace on the shell of the Spantik is very thin, 1mm and comes with a rubber sleeve pull over a knot in the lace. This rubber sleeve will pull off with ease leaving just a tiny knot to pull on. Clip on a plastic zipper pull that is found on most jacket these days. The zipper pull not only gives a bigger area to pull on but will not come off even pulling very hard on the lace which is required to secure the skinny lace around the post. Superfeet Wintergreen Footbeds: A quality after market footbed both supports and controls the foot while adding just enough cushioning that the footbed can still support and control the foot. Superfeet's capsule supports body weight through bone of the foot and leg, not the weak arch of the foot so they support and control like no other footbed. The Wintergreen has Outlast insulation under the foot for climate control and moisture control. Black Diamond Viper Ice Tools: Every good thing must come to an end. I have retired my first generation Cobra ice tools. Why? From waterfall ice in Alaska, to sport ice / mixed climbing in Ouray Ice Fest 2005 to the big alpine ice routes of the Range, everything the Cobra did well in these environments the Viper does better, and this includes shaft vibration. No tool on the current market offers as much shaft clearance for the steeps that stills allows a natural swing on the moderate and will shaft plant in the alpine world. BD's pick attachment is the easiest-to-change of any tool on the market. I still climb on and prefer the BD Twist Leash for their ease of use; nothing to pull, push, clip or freeze and when releasing the tool it dangles shaft up for easy re-grab. Black Diamond no longer makes the Twist Leash so the Lockdown Leash is the next best leash design, every tool manufacture now makes their own design of the Lockdown. One-dimensional removeble leashes are for road side sporties. Tool Stick: This may be sacrilegious to those that are brand name fanatics but to get the max performance from my Viper tools, I have hot rodded Grivel picks to work on my Vipers. The hot forging and design of Grivel picks stick and hook in ice better, and they stay sharper longer than the rest. A plus is the logo area along the pick adds a broken surface for rock to grab and hold while torquing in cracks. The Cascade pick has a similar droop to the BD so it is the one I use most for all terrain climbing. When my sole goal is steep convoluted ice, the Evolution picks steeper droop hooks superbly in convoluted ice but does not swing natural on moderate ice. 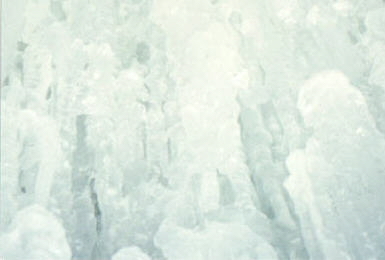 Plus the thinner profile also shatters less ice when its thin and steep. Lay a BD pick over the Grivel pick aligning the tip and teeth together and you will see a perfect line to cut off the area of the Grivel attachment area that holds the pick in the head. File the area to match the BD. The large weight reducing hole of the Grivel is the bolt hole. Drimmel the alignment groove into the Grivel pick. Bolt on and go climbing! Black Diamond Venom: There is much ado circulating around about the Venom and most of it is not quite right. It is not a copy of someone else�s design on a compound shafted mountaineering axe, the Venom is a full on technical alpine terrain ice weapon. About three years ago I chatted with the BD backshop gear guys about making the perfect alpine ice tool by taking the Rage, increasing the shaft to 55cm, shorten the rubber grip to just longer than gloved hand and remove the pinky shelf. They were curious and I was told the idea was kicking around BD. Whether I inspired them or not it does not matter but the Venom is superbly better than what I considered. These tools scream alpine ice. Pairing the 50cm/57cm axe and the 50cm hammer attached with Tech Picks builds a pair of ice tools that have performed on Ruth Gorge gully ice and grade 5 Valdez cicles. If you cannot climb steep frozen terrain with a pair of Venoms in your hands then you need to find a new passion. Grivel G14 Crampons: I consider these the best all terrain crampon ever produced. Other crampons may have better performance on specific terrain because they are specialized to perform on these single disciplines and due to this will fail on the others. G14s do it all very well and even better than some specialized spikes. The hot forged front points have no peer for stickiness in ice or on rock, and stay sharp with abuse. The curly Q pigs ear front wire bail absorbs some impact for those times when kicking too hard fractures the ice, which is a technique error but it is still frequently done. While G14s are on the heavy side and are in fact heavier than advertised, at times a slight increase of weight is worth the performance edge. Cutting off any extra length of the sizing bar should be the first thing done to any crampon. Drilling a few holes in the down points and frame will help decrease weight too. Adding the G10L alloy rear frame piece drops the weight by 4 ounces. Tool Stick: Having trouble with mono points on soft ice and alpine like the paid gear reviewers say? The biggest error I see with mono points is they are too short. Adjust your mono points to there longest length or near it anyway. The front part of the crampons frame should align with the end of the boot toe sole, not behind it by a 1/4" or more as so many climbers do. Then adjust the mono point. I have used mono points adjusted this way climbing waterfall and mixed climbing here in Alaska and Ouray Colorado, and alpine routes in the Alaska Range with no problems. Tool Stick: I have been testing BD's new Cyborg crampon. This spike will replace the Bionic and it out performs it with ease. Its lighter than the Bionic and the G14 but like the Bionic, it is still designed with a specialized point configuration for very steep techincal terrain but work OK in the all terrain alpine game. Sterling Rope Evolution 8.4 Half-Ropes: Skinny half-ropes have become very popular because of their light-weight and low impact force but all suffer the same problem; they wear extremely fast and become kink-o-matics due to their thin single-pic 2-ply sheaths. Sterling's 8.4mm rope has their hard wearing double-pic extra twist rate sheath that produces a good hand for rope work with this skinny cord. I have been using these ropes in 70-meter length for three years now and can honestly say they are the perfect half-ropes; light at 44g /meter, 8.4mm diameter is easy to work with diameter, a super tuff sheath that shows little wear yet impact force low enough that they can be used as traditional half-ropes or clipped together as twin-ropes for extra safety margin for any rope. Mammut Serenity 8.9 Single-Rope: The new single-rope lightweight leader on the market that has Mammut's legendary performance with weight savings for the lightest best performing single-rope on the market. When it comes to ropes, pure weight savings at times is negated by better performance and/or durability of thicker ropes but this skinny cord�s 2 gram per meter weight savings combined with better performance over the life in actual climbing means no other rope is better suited to ice and alpine climbing. This thread is a delight to use with effortless rope work on ice and alpine steeps while it slithers with minimal friction. And its small package and weight doesn't hurt on approaches either. Mammut�s dry coating is the one of best and longest lasting around. In addition to waterproofing, they now coat individual fibers of the rope with Teflon which decreases friction and heat within the rope for increase in performance and durability, this is why they can spin a rope this skinny. And with Triosafe markings that mark the middle and five meters from each end of the rope means you also always know how much rope is left. This string at 70 meters allows eating up the terrain at an enormously quick rate. The Serenity 8.9 paired with a 6mm tag line weighs in at a svelt 77 grams per meter rope system. Black Diamond ATC XP Guide: This is absolutely without a doubt the very best autoblocking belay device yet designed. Take one ATC XP and hot forge a plaquette on the opposite side of the rope grabbing grooves and you get the Guide. The Guide has rid all the nuisances of every other autoblocking device; it does in fact work with 7.6mm twin-ropes and 10.6 single ropes, and every rope diameter in between, the teethed grooves bite and hold like a Pit bull whether autoblocking, lead belaying heavy climbers or rappeling overhung terrain with a heavy pack and smoothly feeds all rope diameters whether the ropes are dry, wet or frozen. BD also added another wing with a tiny hole on the grooved side of the Guide that makes releasing the Guide in autoblocking mode the easiest device so far. Take a skinny sling and feed it through the hole, girth hitch it to the hole, run the sling up and over the Guide to the other side, clip to your harness to the sling and pull down on the sling or use a sling long enough to use your foot to step down on the sling and the Guide rotates releasing its autoblocking grip, easy easy easy. I am sure this release hole will be a copied design. Mammut Contact Slings: Dyneema at 8mm wide in a very thin profile with the nylon weaved at the edges for visibility; these are the lightest-easiest-to-use full-strength runners out there. Just the ticket for reducing the weight of the rack. I like the slightly stiffer flex of these for easier use especially wearing gloves. But with all that white Dyneema and the lack of color, these slings are very hard to see in low light snowy alpine, especially the shark gray color so ensure you use the yellow, red or blue. Tool Stick: The Contact slings will go to 6mm in diameter for Spring 06. These feel more round like perlon than flat like webbing due to minimal material of the sling. But, currently they only come in the gray color and in my opinion from using this color for a sling on gray alpine ice, they are very hard to keep an eye on. For safety reasons especially for ice and alpine, I prefer the 8mm in the darker orange color until Mammut adds color to the 6mm Contact. DMM Ripstop Shock Absorbing Slings: Sewn from 3/4" tubular webbing, these load reducing slings have a smaller profile than Yates Screamers taking up less room on the rack. Of course they are 3 ounces lighter in weight too with the same 2-4kN load reduction. Atomic Chugach Skis: Specifically designed to meet the needs of Alaskan climbers. This is a much lighter and more effecient ski set-up with the use a waxless pattern base over a traditional mountaineering ski with climbing skins. The kick and glide of the camber-and-a-half waxless pattern of these skis will leave skis with a flat alpine camber with climbing skins far behind in little time due to less friction of the climbing skins dragging on the snow. This ski is perfect for skiing up the river bottoms, into the backcountry and on the glaciers of the Alaska Range. Tool Stick: While the Chugach is the very best approach ski there is, it does not have a leash hole in the tip for carrying or glacier travel and the host of other things this hole allows. I am working on this with Atomic and this problem is said to be fixed in the future. But for now, drill a hole in the tip all the way through the base; start with a small pilot drill bit and work your way up to a larger 3/8" diameter hole. Take a two-part epoxy and seal the core of the ski. Tie your perlon. Mounting Tip: Chugach skis are designed around a touring ski rather than a mountaineering ski. The mounting plate has a narrow heel area that can cause some strain on the heel piece of the Silvretta 500 binding. Using a washer on the two rear mounting screws will aligned it all up. Again, Atomic is a ware of this problem and is said to be working on it. Also, tell your ski tech when mounting to mount Silvretta 500 bindings 1cm in front of cord center. The North Face Fission Sleeping Bag: Everybody seems to think it is cool to jump on the bash The North Face steamroller as it seemed they lost their focus. But after talking to the new head shed at TNF this winter, things are changing for the good. TNF is getting back to their core climber values and no longer will TNF be at the top of the list of complaints. They start with this superb synthetic sleeping bag, the Fission. Perfect alpinist temperature rated at 20F and it will be the lightest synthetic filled bag on the market at 2 pounds 4 ounces for a six foot length which rivals any down bag. It also has a half-length zipper that no only decreases weight but allows for easie tie-in use with bivy sack. A major plus is, the synthetic fill has a lifetime guarantee; if the fill ever goes flat, it can be returned to TNF for replacement once again rivaling down for long term use. Cascade Designs Z-Rest Sleeping Pad: Light, compact and closed-cell foam. The egg carton design is what makes this foam pad Select. The little cups not only add comfort and dead air space for warmth without adding weight, water collects in the pockets keeping the water from spreading over your entire sleeping area and for easy expulsion. Black Diamond Firstlight Tent: The most amazing shelter made at 2 pounds 8 ounces with room for two plus gear. The famous I Tent design made with a polyester Epic fabric top and a silnylon floor. Not only is it light in weight but can be compressed to half the size of it's stuff sack. This tent has amazing vapor transfer yet is still remarkably weatherproof; Alaskan rain, snow and wind. If you prefer more space the Lighthouse is built on the Eldorado dimensions with an Ahwahnee door design built from the same Epic and silnylon, weight is 3 pounds but the roof awning can be a scoop wing for when the wind decides to howl. Black Diamond Winter Bivy: This is the bivy sack for super-light ascents. Made entirely from Epic fabric for 9 ounces in weight but is is still very storm-proof. A nice rectangle design holds a full length pad, boots, stove and, etc., yet will still allow the average +20f sleeping bag to loft; the perfect temperature range for the alpinist. The Epic fabric has amazing vapor transfer and will allow damp clothing to dry. The small across the chest opening requires some slithering into but zips out the weather; never completely zip tight a bivy sack sealing out fresh air. Tool Stick: Cut a small slit in the side seam of the bivy sack on the same side as your sleeping bag's zipper then back stitch the slit and seam seal the edges. Now when on the steep you can slide a sling through the slit and tie-in. To get the fabric off my face, I have sewn a bendable derlon rod into the seam of the flap that covers the zipper, weight added is one and a quarter ounce. Wild Things Spectra Andinista: Over the years I have tried several other packs but I keep coming back to the Andinista as my favorite pack. Every feature of this pack is designed for climbing the steeps and now it is constructed from Spectra; 3 pounds 1 ounce size medium on a mailscale. I can approach 5000ci of camp gear, slim it down to 3500ci or 1800ci to get steep or just use its 4250ci standard volume. The removable waist belt gets the belt off the pack out of the way so it does not interfere with my harness, or flop around unfastened while climbing the steep. The bivy sleeve is long enough to bivy in, not comfortable by any means but it has seen me through several bivies. Of course I hear how poor it carries but I find no problems so ensure the packs fits and is adjusted right, it is packed correctly for climbing, carry less weight, get tuffer or just stay home. Tool Stick: Take about 3" of 3/4" flat webbing and sew it to the waist belt just behind and slightly above the gear loops. Leave an un-sewn slot about 1/2" wide that will allow a BD Ice Clipper through. Rack gear on the gear loops then clip ice tools to the Clippers. Of course, I clip just about everything to Ice Clippers. Black Diamond Speed 33 Pack: Take the current Speed 30, add some room for bivy gear with the ability to carry two tools and crampons plus a single aluminum stay. While the single stay does add support for heavy loads on approach, it is still not clear why they did this for an assault type pack. Remove it and this 1 and half pound pack is ideal for 1-2 day alpine assaults. Coming soon, Black Diamonds Alpine Guide pack, volume of the current Shadow increased to around 4000ci plus more. This new pack from BD should be available fall 2006. Mountain Safety Research Superfly Stove: This stove has high heat output from minimum weight. The large diameter burner head puts more heat on the bottom of the pot producing super-fast boil times. The flame adjusts from mild simmer to full lift-off power. While the auto-start feature is nice, I find they are un-reliable on the wet steep. Mountain Safety Research Titan Pot: Titanium does not spread the heat over the whole pot like steel or aluminum so you end up with a hot spot concentrated right over the burner which tranfers the energy quicker into the water for faster boil times. Not to mention titanium is extremely light-weight. Bibler Hanging Pot: For those times when a hanging stove is a must, this is the lightest, easiest to use hanging system on the market. The listed weight (and gear reviews do not mention this) includes a very heavy pot with lid, and a steel wire pot support used in the bottom of the windscreen for stoves without pot supports (Primus) and a huge heavy pot grabber. Throw all these useless extras away and keep just the aluminum hanging windscreen which weighs about 3 oz. Thread a MSR Superfly stove into the hanging system, use with a MSR Titan pot for a 14 oz hanging stove system. Mountain Safety Research Isopro Fuel: I have performed unscientific tests and have come to a conclusion that MRS IsoPro fuel consistently performs better than standard propane / butane mixed fuel. Also a more constant heat output till empty and in below freezing temperatures; down to mid-teens without a fuel cartridge heater. Mountain Safety Research Simmer Lite Stove: The lighest white gas stove on the market at 9 oz. This stove produces near the heat output of the XGK but is half the weight. Fassion a wind screen out of heavy foil. For longer trips, colder weather, melting large amounts of snow or for those who like and prefer white gas, this is the light-weight stove to use. WildThings Yellow Pig: Well, its actually gray now but no matter the color or name, it can double as a drag bag / waterproof sled bag.